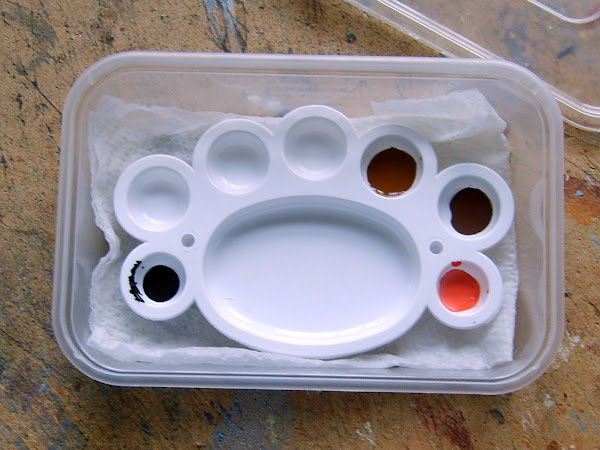 Have you seen the various posts about wet palettes? I have but was put off by the need for special paper to line the palette. I also wondered if the colours would stay separate. The latter is a particular problem as I nearly always dilute my paints. Top up the clean water as and when required. I think this will prove better than the paper based versions as the palette will keep the paints apart and is easily removed for cleaning. At the time of writing, the palettes are also available from Amazon for £0.95 with free delivery from a Hong Kong supplier. I like the pink one! Link to the TMP thread. Don't believe the hype! Despite you assertion to the contrary I do understand how a "conventional" wet palette works. However, the semi-permeable papers they use are just that and nothing more. They can't be that permeable or the paint would leach through. After over a year's experience of using the above set up I can say that putting a "dry" palette in a container with water and a sponge works just fine. It will keep paint of any consistency fluid for weeks with ease. The most important factor is keeping the air inside the container suitably humid. The nature of the layer between the paint and the source of moisture isn't crucial. Plus the above has the advantage you can put a mild kitchen cleaner in the base which prevents the growth of mould which you can't do with a conventional wet palette.